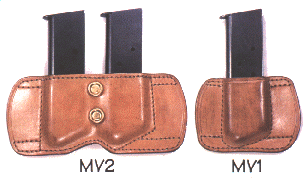 Holsters and magazine holders : ideal covert carry companions. 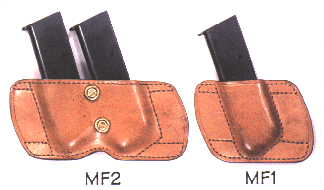 Magazine-Holders MF1, MV1, MR1 (Single) and MF2, MV2, MR2 (Twin) are designed specifically for use with single stack magazines only. 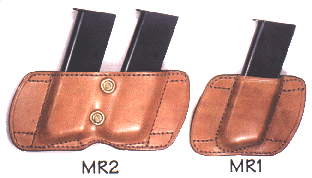 They are ideal companions for any and all Horseshoe holsters. Magazines are held with bullets forward as standard. Offering a choice of forward rake, vertical rake or rear rake, these low-profile magazine-holders will cover every eventuality and requirement of concealed carry. All are friction fit, but twin holders are equipped with ABS inserts and twin variable-tension screws. Wide-spaced tunnel loops provide an ultra-flat profile and allow for positive positioning over a trouser belt-loop.The rear protection tab option is not available with these holders.